Showers this evening becoming a steady rain overnight. Low 52F. Winds SE at 10 to 15 mph. Chance of rain 80%..
Showers this evening becoming a steady rain overnight. Low 52F. Winds SE at 10 to 15 mph. Chance of rain 80%. The Courier Express is a Monday-Friday evening daily newspaper printed at 9:00 a.m., delivered by 5 p.m, circulation approximately 10,000. It covers the DuBois area of Clearfield County and most of Jefferson County, plus the southern half of Elk County in depth, reaching up into Johnsonburg and southern McKean and Forest counties. 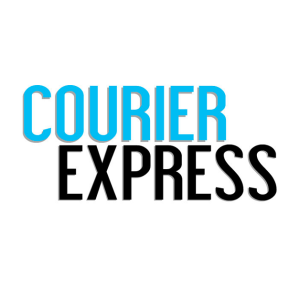 It was established in 1944 when the Daily Courier (founded as the Weekly Courier in 1879) and the Daily Express (founded as the Express in 1883) consolidated to become the Courier-Express. The history of the Courier-Express begins within a decade of the start of the history of DuBois, where it is located. In 1872, John DuBois came to the then-village of Rumbargertown to start his lumbering operations and eventually to have the city named after him. Seven years later, Bion H. Butler founded the Weekly Courier, printed at what is now Brady and Scribner streets. J.A. Johnston took over from Butler and published the weekly newspaper until Oct. 20, 1884. On that date, E.W. Gray and E.S. Gray bought the newspaper. One year earlier, in 1883, a competitor appeared. The Express was organized by Frank McMichael and H.C. Wilson, and appeared in October as a weekly. Four years later, on Jan. 2, 1888, the weekly newspaper became a daily newspaper, the DuBois Morning Courier, founded by E.W. Gray and Co.. In 1900, it became incorporated as Gray Printing Company. It was located in a small office at the rear of Brady Street and East Long Avenue, until the fire of June 18, 1888 destroyed its office as well as most of downtown DuBois. That same fire destroyed the Pettigrew Building offices of the Express. At that time, the only source of news outside DuBois was to "clip," actually plagiarize, the news from the large-city daily newspapers and reprint it 12 hours later. On June 14, 1889, the Morning Courier moved into the Hight Building, where it stayed until 1926, then moving to West Long Avenue and High Streets. A Universal cylinder press was installed, first powered by steam, later by a gas engine and finally by electricity. About 1905, the first Linotype typesetting machine was installed, replacing the practice of setting each letter of each line of type by hand. During the same time, the Express moved into the Knarr Building on Brady Street and, in 1890, was bought by David Reams. Another fire, this one in 1898, left the Express homeless again. It later moved into new quarters in the former Bob's Army and Navy Store building. In 1895, the Express became a daily newspaper with Charles H. Redfern as editor. In 1897, V. King Pifer became editor. In 1904, H.H. Rutter was the editor. In 1906, David C. Whitehill bought the Express, and W.B. Ross became its editor. Early in the 1900s, the Morning Courier joined the Associated Press "pony" service, which consisted of several western Pennsylvania newspapers being hooked up to a "reader" in Pittsburgh who dictated news in two 15-minute periods to be transcribed by typewriter by editors in the half-dozen cities where the local papers were located. In 1909, A.E. Hasbrook bought an interest in the Express and changed its name to the Daily Express. In 1914, E.S. Gray sold his interest in the Morning Courier. In 1921, H.T. Gray entered the business and in 1923, J.S. Gray entered the business at the time of the death of E.W. Gray. On May 16, 1927, the Gray Publishing Company took over the Daily Express. The two newspapers were published as separate newspapers for 17 years, with J.S. Gray editor of the Express, W.B. Ross the editor of the Morning Courier. A Courier-Express retrospective published in 1957 said the Courier was generally recognized as "dry" (promoting Prohibition) and Republican, while the Express was "wet" (against Prohibition) and Democratic. The two newspapers became one newspaper during 1944 when World War II shortages of newsprint and workers forced the consolidation. W.B. Ross retired as editor in 1953, and F.I. Gillung was editor until 1956. George Waylonis became the editor in 1956 and Marvin Bloom became general manager. In 1957, the newspaper installed a 32-page Hoe press, doubling its previous 16-page printing capacity. In the 1980s, Jason Gray became publisher. In 1988, the newspaper was sold to McLean Publishing Co. of Bryn Mawr, Pa. The parent company, Independent Publications Inc., also owns daily newspapers in Nashua, N.H., groups of daily newspapers, weekly newspapers and shoppers in the Tampa-Bradenton-Kissimmee area of Florida and operates a commercial printing business, Evergreen Printing, in Bellmawr, N.J., as well as Independence Communications Inc., a sound and communications business with offices in Pennsylvania, Virginia and North Carolina. Independent Publications Inc. is owned by William L. McLean III, a third-generation newspaperman, and his family. Andrew Bickford is its president and chief executive officer. 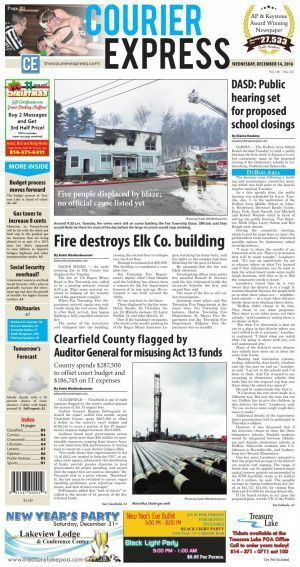 In 1990, McLean Publishing Co. bought the Jeffersonian Democrat and the Brookville American, each one a weekly newspaper published in Brookville, Jefferson County, by the McMurray Printing Co. Kenneth Frizell became publisher. In 1993, the McLean newspapers pooled their resources and founded Tri-County Sunday. In 1994, W. Dock Lias became publisher. In 1998, McLean Publishing Co. bought The Leader-Vindicator of New Bethlehem. In 2001, Denny Bonavita, formerly the managing editor of the Courier-Express/Tri-County Sunday, became McLean Publishing Co. publisher. Nick Hoffman became the managing editor of the Courier-Express/Tri-County Sunday, with Randy Bartley as the editor of the Jeffersonian Democrat and Josh Walzak as the editor of the Leader-Vindicator. Ryan Wells is the general manager of the Leader-Vindicator. In 2014, Joy Norwood, formerly the Sunday editor of the Courier-Express/Tri-County Sunday, became editor of the Courier-Express/Tri-County Sunday. A.J. Sylvis became the managing editor of the Courier-Express/Tri-County Sunday. By upgrading to a Featured listing, you can upload photos, videos and control the content and display of your premium business profile! Posting relevant, expert content about your business helps drive traffic to your Web site, highlights you as an expert in your field, and really fires up your SEO (Search Engine Optimization). Enhancing your Marketplace listing page will ensure that potential customers and clients will think of you first instead of the competition!